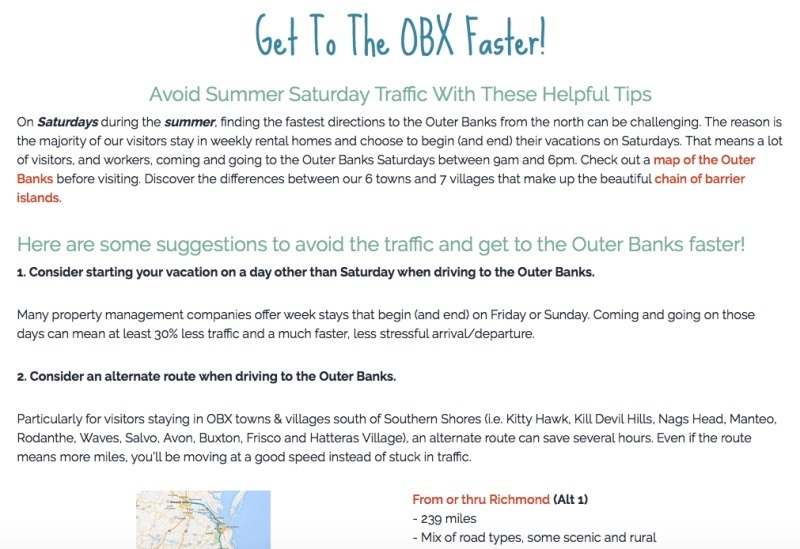 Get to the OBX Faster! Most of us came to the Outer Banks due, in large part, to it’s isolation. Living at the beach is far different than living in a city. Locals know each other, if not, we know someone who does. This small town feel is what most of us love about living here. Of course this is in addition to the obvious reason of the ocean! But as we all know, come here on Saturday and Sunday (not as bad) during the season and you might as well be in Los Angeles! I’m of course talking about the traffic. It may be our imagination, but locals are talking about how the traffic seems to be even worse this year. Ten years ago, if I had to drive to Duck for a Saturday appointment all I had to do was leave before 11 am. This year I’ve been at a dead stop on my way to Duck at 8:30 am. Where are all of these people going when check in for most is not until 4? One reason for the increase is that everyone seems to drive to their vacation these days. Mom, dad, kids, grandma…they all have to take their own car. I’ve seen as many as 20 vehicles parked in front of a home.